Leyland 1939 FLJ 356 1939 LEYLAND Cub pump escape. Leyland petrol engine. Limousine body. A question for all those knowledgeable about Leylands! Does anyone know the history or have pictures of JRE114 a '38/'39 Leyland? Added by Dr. B.A. Hutchinson on 13 August 2009. 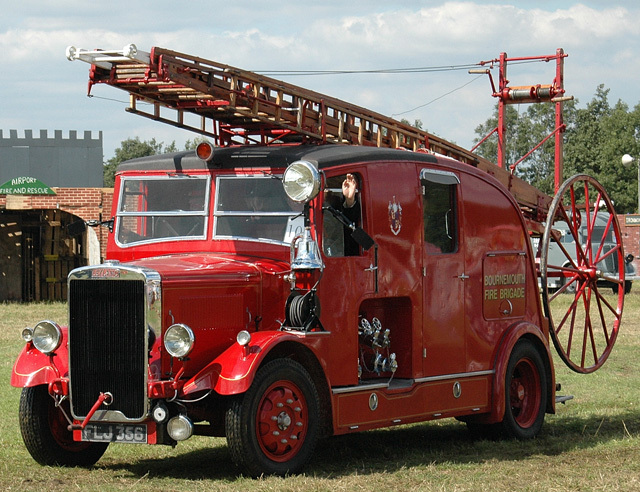 Barry(JRE 114),I can't tell you much about the appliance history,but the one you mentioned is a 1939 Leyland Cub FK8 and was issued to Tamworth Joint Fire Brigade in September of 1939. Added by Pete Matten on 13 August 2009. Added by Reverend K S Oliver on 20 August 2009. Reverend K S Oliver,before any answers can be added to your request,we need to know what year and what actual model the appliance is.The first of the FKT and F5/F7 Series of Leyland Cub's first came around 1937,but several engines were used in the different models being introduced. A very good sourse of information can actually be obtained from purchasing the book'Leyland Fire Engines'1930-1942.Its a Leyland Fleet Series book published by The Leyland Society.The cost of the book first published in 2003(still available)is just £8.95 and is available from any good bookshop.Ask for title-then ISBN 0-9545216-1-7. I hope this info is of some help to you in the preservation of your Leyland Cub????. Added by Pete Matten on 20 August 2009.